#17 Oliver Ames, 0 @ #16 Taunton, 1 – Final (OT) – Click here for a recap and photo gallery of this game. #18 Franklin, 7 @ #15 Westwood, 3 – Final – Click here for a recap and photo gallery of this game. #19 North Attleboro, 1 @ #14 Plymouth North, 0 – Final – North Attleboro’s Abby Calistra scored in the first half on an assist from Kayley Gorman to help the Rocketeers score the upset on the road. Big Red will play at #3 Walpole on Saturday at 4:00. #9 Oliver Ames, 1 @ #8 Brockton, 3 – Final – Click here for a photo gallery from this game. 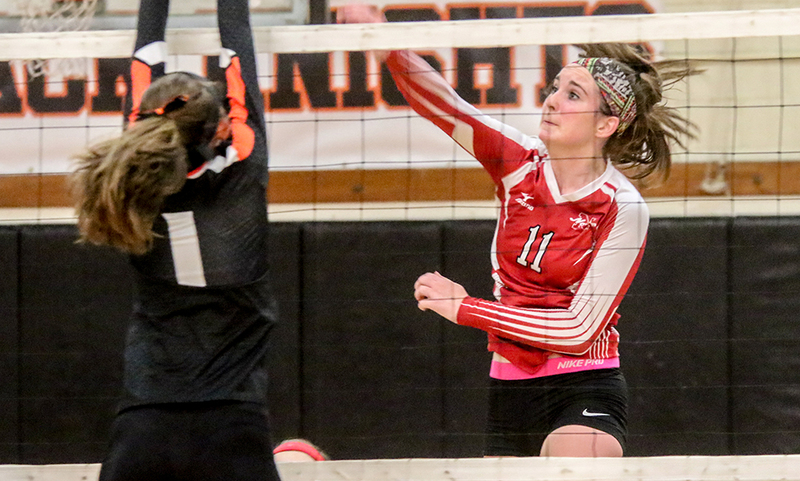 #6 Franklin, 3 vs. #11 Wachusett, 0 – Final – Franklin took care of business in its opening game of the state tournament, sweeping Wachusett (25-21, 25-15, 25-23). Junior setter Lauren McGrath had a balanced game with 31 assists while adding six digs and a pair of aces. Maggie Doyle (one block) had nine kills while fellow middle Meaghan Maguire (one block) finished with eight kills. FHS coach Kate Horsmann noted Riley Marino, Shannon Gray, and Lauren Bissanti all played well defensively and in serve receive.